Naphazoline Nitrate is a rapid acting sympathomimetic vasoconstrictor of occular artierioles. It acts to decrease congestion of the conjunctiva and is found in many over-the-counter eye drops. 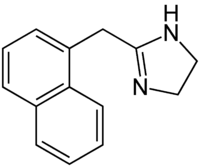 Naphazoline is primarily indicated in conditions like Corneal vascularity, Hyperaemia, Itching, Nasal congestion, and can also be given in adjunctive therapy as an alternative drug of choice in Sinusitis. Click here to contact Farmak about this product. It is a sympathomimetic agent with marked alpha adrenergicactivity. It is a vasoconstrictor with a rapid action in reducing swelling when applied tomucous membrane. It acts on alpha-receptors in the arterioles of the conjunctiva to produce constriction, resulting in decreased congestion. It is an active ingredient in several over-the-counter formulations including Clear Eyes and Naphcon eye drops. A. Sonn, U.S. Patent 2,161,938 (1939).